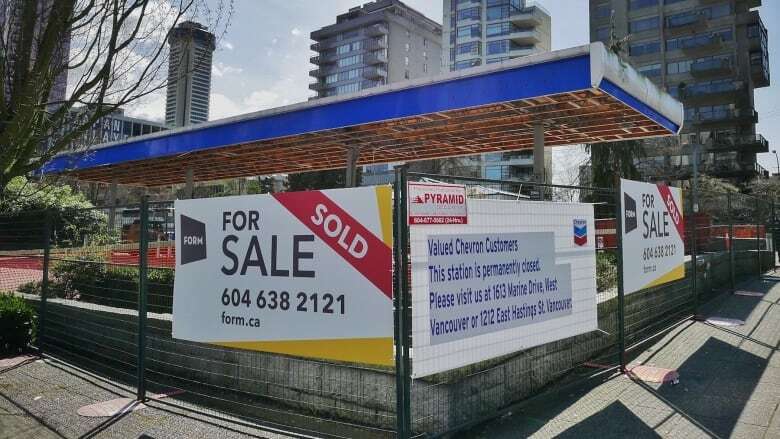 Motorists looking for a place to top up their cars in downtown Vancouver will soon be out of luck, as the area's last gas station is now up for sale. 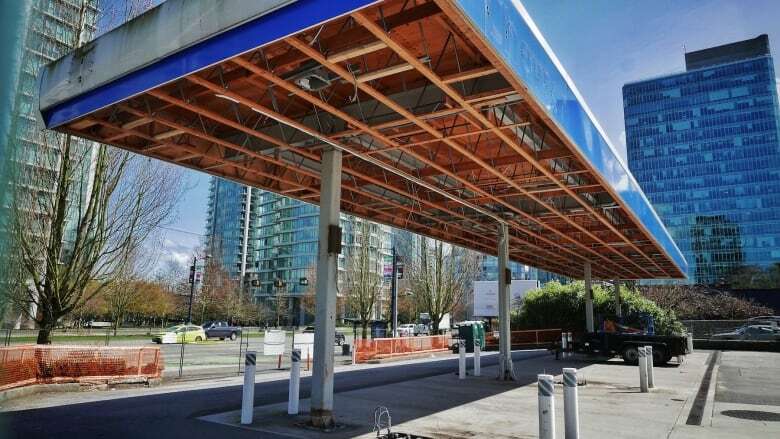 Motorists looking for a place to top up their cars in downtown Vancouver and the West End will soon be out of luck — the area's only gas station is now up for sale and potentially heading for redevelopment. 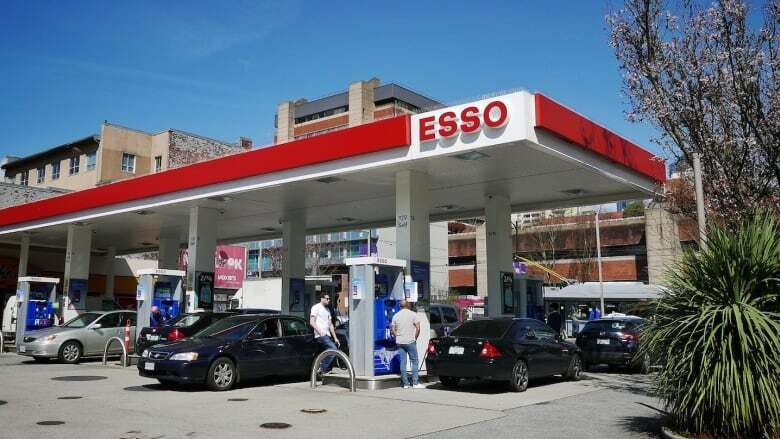 The Esso station at Burrard Street and Davie Street, which has been rumoured to be heading to market for a few months, is now listed as part of a Colliers International land portfolio. The listing doesn't suggest a price, but B.C. Assessment valued the land alone at more than $36 million last year, a $3 million increase from the previous year. "I think it's really not surprising, I think a lot of these gas stations have a lot of real estate associated with them," said Tsur Somerville, professor at the University of British Columbia's Sauder School of Business. "The margins on a gas station are certainly small, relative to what you could make redeveloping those as basically anything, whether it's office building or condo," said Somerville. According to the Colliers listing, the gas station, which has been owned by 7-Eleven since Imperial Oil sold its Esso stations in B.C. last year, paid $391,192.30 in taxes in 2016. The property is zoned Downtown District Comprehensive Development, with a maximum height of 300 feet (91.4 metres), meaning many different types of development could be built there, from light industrial to residential or commercial. "I think when you look at other major cities, or dense urban areas around the world, you don't see a lot of gas stations in downtown San Francisco, and I think I counted five gas stations in Manhattan south of Central Park, which is not a lot, considering how many people are there," said Somerville. 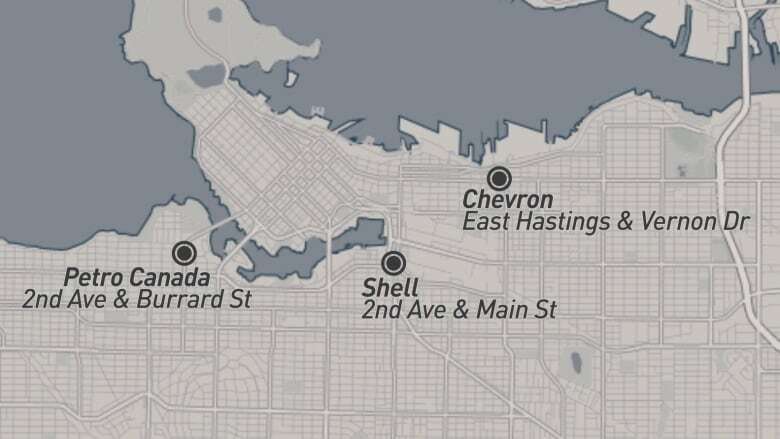 If the station is sold and redeveloped, Vancouver will become the first major Canadian city without a single gas station in its downtown core. Late last month, the only other place to fill up on the downtown peninsula — a Chevron station on Georgia Street at Bidwell street — was shuttered. Downtown and West End motorists will have to cross a bridge or drive to the other side of False Creek to fill up, once the Esso closes. For Downtown Vancouver Business Improvement Association CEO Charles Gauthier, the issue isn't losing a few more pumps downtown. It's a broader concern about keeping a variety of businesses in the community. "We need to have that spectrum of affordability for different types of business and also for people that live within the city itself, said Gauthier. "If we're down to one or zero, it does become a concern and it does point to the issue that we need to address — the affordability issue," he said. Whatever development winds up on the site, the property will first need to undergo remediation to remove contaminants. Peter Reid, an environmental engineer and vice president of the Contaminated Sites Approved Professionals Society, said there are a lot of site-specific variables that could affect how much work will be required. But he doesn't expect the property to sit idle for long before it's redeveloped. "In downtown Vancouver, it would cost too much money to leave the site for 10 years to remediate it with in situ techniques, so usually it fits right in with the development schedule," he said. "When you dig out your soil for your underground parkade, then you start getting your reports ready." Reid said he'd worked on gas stations with remediation costs ranging from $20,000 to several hundred thousand dollars, and it all depends on factors like the gas station's age and what sort of soil, clay, sand and rock lies beneath it. Colliers' listing invites anyone interested in buying the property to make an offer on or after Feb. 22.